“Thou hast ascended up on high: Thou hast led captivity captive; Thou hast received gifts for men, even for the rebellious, that the Lord God might dwell among them” (Eph 4:8-11). The Church of Rome, at its first planting, had the divinely bestowed gift of a Scriptural ministry and government; and then “its faith was spoken of throughout the whole world;” its works of righteousness were both rich and abundant. But, in an evil hour, the Babylonian element was admitted into its ministry, and thenceforth, that which had been intended as a blessing, was converted into a curse. Since then, instead of sanctifying men, it has only been the means of demoralising them, and making them “twofold more the children of hell” than they would have been had they been left simply to themselves. If there be any who imagine that there is some occult and mysterious virtue in an apostolic succession that comes through the Papacy, let them seriously consider the real character of the Pope’s own orders, and of those of his bishops and clergy. From the Pope downwards, all can be shown to be now radically Babylonian. The College of Cardinals, with the Pope at its head, is just the counterpart of the Pagan College of Pontiffs, with its “Pontifex Maximus,” or “Sovereign Pontiff,” which had existed in Rome from the earliest times, and which is known to have been framed on the model of the grand original Council of Pontiffs at Babylon. The Pope now pretends to supremacy in the Church as the successor of Peter, to whom it is alleged that our Lord exclusively committed the keys of the kingdom of heaven. But here is the important fact that, till the Pope was invested with the title, which for a thousand years had had attached to it the power of the keys of Janus and Cybele, * no such claim to pre-eminence, or anything approaching to it, was ever publicly made on his part, on the ground of his being the possessor of the keys bestowed on Peter. Few lies could be more gross; but, in course of time, it came to be widely believed; and now, as the statue of Jupiter is worshipped at Rome as the veritable image of Peter, so the keys of Janus and Cybele have for ages been devoutly believed to represent the keys of the same apostle. * The Turkish Mufties, or “interpreters” of the Koran, derive that name from the very same verb as that from which comes Miftah, a key. Thus we may see how the keys of Janus and Cybele would come to be known as the keys of Peter, the “interpreter” of the Mysteries. Yea, we have the strongest evidence that, in countries far removed from one another, and far distant from Rome, these keys were known by initiated Pagans not merely as the “keys of Peter,” but as the keys of a Peter identified with Rome. In the Eleusinian Mysteries at Athens, when the candidates for initiation were instructed in the secret doctrine of Paganism, the explanation of that doctrine was read to them out of a book called by ordinary writers the “Book Petroma;” that is, as we are told, a book formed of stone. But this is evidently just a play upon words, according to the usual spirit of Paganism, intended to amuse the vulgar. The nature of the case, and the history of the Mysteries, alike show that this book could be none other than the “Book Pet-Roma;” that is, the “Book of the Grand Interpreter,” in other words, of Hermes Trismegistus, the great “Interpreter of the Gods.” In Egypt, from which Athens derived its religion, the books of Hermes were regarded as the divine fountain of all true knowledge of the Mysteries. * In Egypt, therefore, Hermes was looked up to in this very character of Grand Interpreter, or “Peter-Roma.” ** In Athens, Hermes, as its well known, occupied precisely the same place, *** and, of course, in the sacred language, must have been known by the same title. * The following are the authorities for the statement in the text: “Jamblichus says that Hermes [i.e., the Egyptian] was the god of all celestial knowledge, which, being communicated by him to his priests, authorised them to inscribe their commentaries with the name of Hermes” (WILKINSON). Again, according to the fabulous accounts of the Egyptian Mercury, he was reported. . . to have taught men the proper mode of approaching the Deity with prayers and sacrifice (WILKINSON). Hermes Trismegistus seems to have been regarded as a new incarnation of Thoth, and possessed of higher honours. The principal books of this Hermes, according to Clemens of Alexandria, were treated by the Egyptians with the most profound respect, and carried in their religious processions (CLEM., ALEX., Strom.). ** In Egypt, “Petr” was used in this very sense. See BUNSEN, Hieroglyph, where Ptr is said to signify “to show.” The interpreter was called Hierophantes, which has the very idea of “showing” in it. *** The Athenian or Grecian Hermes is celebrated as “The source of invention. . . He bestows, too, mathesis on souls, by unfolding the will of the father of Jupiter, and this he accomplishes as the angel or messenger of Jupiter. . . He is the guardian of disciplines, because the invention of geometry, reasoning, and language is referred to this god. He presides, therefore, over every species of erudition, leading us to an intelligible essence from this mortal abode, governing the different herds of souls” (PROCLUS in Commentary on First Alcibiades, TAYLOR’S Orphic Hymns). The Grecian Hermes was so essentially the revealer or interpreter of divine things, that Hermeneutes, an interpreter, was currently said to come from his name (HYGINUS). The Pope has not merely a chair to sit in; but he has a chair to be carried in, in pomp and state, on men’s shoulders, when he pays a visit to St. Peter’s, or any of the churches of Rome. Thus does an eye-witness describe such a pageant on the Lord’s Day, in the headquarters of Papal idolatry: “The drums were heard beating without. The guns of the soldiers rung on the stone pavement of the house of God, as, at the bidding of their officer, they grounded, shouldered, and presented arms. How unlike the Sabbath —how unlike religion— how unlike the suitable preparation to receive a minister of the meek and lowly Jesus! Now, moving slowly up, between the two armed lines of soldiers, appeared a long procession of ecclesiastics, bishops, canons, and cardinals, preceding the Roman pontiff, who was borne on a gilded chair, clad in vestments resplendent as the sun. His bearers were twelve men clad in crimson, being immediately preceded by several persons carrying a cross, his mitre, his triple crown, and other insignia of his office. As he was borne along on the shoulders of men, amid the gaping crowds, his head was shaded or canopied by two immense fans, made of peacocks’ feathers, which were borne by two attendants.” Thus it is with the Sovereign Pontiff of Rome at this day; only that, frequently, over and above being shaded by the fan, which is just the “Mystic fan of Bacchus,” his chair of state is also covered with a regular canopy. Now, look back through the vista of three thousand years, and see how the Sovereign Pontiff of Egypt used to pay a visit to the temple of his god. “Having reached the precincts of the temple,” says Wilkinson, “the guards and royal attendants selected to be the representatives of the whole army entered the courts. . . Military bands played the favourite airs of the country; and the numerous standards of the different regiments, the banners floating on the wind, the bright lustre of arms, the immense concourse of people, and the imposing majesty of the lofty towers of the propylaea, decked with their bright-coloured flags, streaming above the cornice, presented a scene seldom, we may say, equalled on any occasion, in any country. 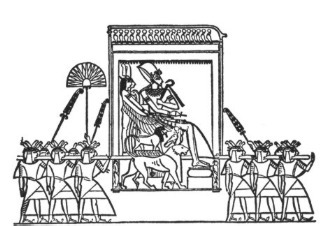 The most striking feature of this pompous ceremony was the brilliant cortege of the monarch, who was either borne in his chair of state by the principal officers of state, under a rich canopy, or walked on foot, overshadowed with rich flabella and fans of waving plumes.” We give, as a woodcut, from Wilkinson (see figure 47), the central portion of one of his plates devoted to such an Egyptian procession, that the reader may see with his own eyes how exactly the Pagan agrees with the well-known account of the Papal ceremonial. 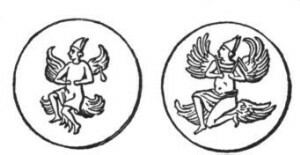 In the West, at a later period, we have evidence that the Pagans had detached the fish-head mitre from the body of the fish, and used that mitre alone to adorn the head of the great Mediatorial god; for on several Maltese Pagan coins that god, with the well-known attributes of Osiris, is represented with nothing of the fish save the mitre on his head (see figure 49); very nearly in the same form as the mitre of the Pope, or of a Papal bishop at this day. Even in China, the same practice of wearing the fish-head mitre had evidently once prevailed; for the very counterpart of the Papal mitre, as worn by the Chinese Emperor, has subsisted to modern times. “Is it known,” asks a well-read author of the present day, in a private communication to me, “that the Emperor of China, in all ages, even to the present year, as high priest of the nation, once a year prays for and blesses the whole nation, having his priestly robes on and his mitre on his head, the same, the very same, as that worn by the Roman Pontiff for near 1200 years? 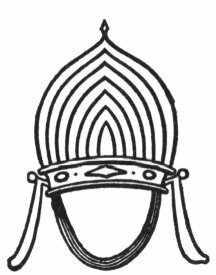 Such is the fact.” In proof of this statement the accompanying figure of the Imperial mitre (see figure 50) is produced —which is the very fascimile of the Popish Episcopal Mitre, in a front view. The reader must bear in mind, that even in Japan, still farther distant from Babel than China itself, one of the divinities is represented with the same symbol of might as prevailed in Assyria —even the bull’s horns, and is called “The ox-headed Prince of Heaven.” If the symbol of Nimrod, as Kronos, “The Horned one,” is thus found in Japan, it cannot be surprising that the symbol of Dagon should be found in China. But there is another symbol of the Pope’s power which must not be overlooked, and that is the pontifical crosier. Whence came the crosier? The answer to this, in the first place, is, that the Pope stole it from the Roman augur. The classical reader may remember, that when the Roman augurs consulted the heavens, or took prognostics from the aspect of the sky, there was a certain instrument with which it was indispensable that they should be equipped. That instrument with which they described the portion of the heavens on which their observations were to be made, was curved at the one end, and was called “lituus.” Now, so manifestly was the “lituus,” or crooked rod of the Roman augurs, identical with the pontifical crosier, that Roman Catholic writers themselves, writing in the Dark Ages, at a time when disguise was thought unnecessary, did not hesitate to use the term “lituus” as a synonym for the crosier. Thus a Papal writer describes a certain Pope or Papal bishop as “mitra lituoque decorus,” adorned with the mitre and the augur’s rod, meaning thereby that he was “adorned with the mitre and the crosier.” But this lituus, or divining-rod, of the Roman augurs, was, as is well known, borrowed from the Etruscans, who, again, had derived it, along with their religion, from the Assyrians. As the Roman augur was distinguished by his crooked rod, so the Chaldean soothsayers and priests, in the performance of their magic rites, were generally equipped with a crook or crosier. This magic crook can be traced up directly to the first king of Babylon, that is, Nimrod, who, as stated by Berosus, was the first that bore the title of a Shepherd-king. In Hebrew, or the Chaldee of the days of Abraham, “Nimrod the Shepherd,” is just Nimrod “He-Roe;” and from this title of the “mighty hunter before the Lord,” have no doubt been derived, both the name of Hero itself, and all that Hero-worship which has since overspread the world. Certain it is that Nimrod’s deified successors have generally been represented with the crook or crosier. This was the case in Babylon and Nineveh, as the extant monuments show. 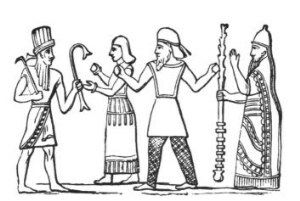 The accompanying figure (see figure 51) from Babylon shows the crosier in its ruder guise. In Layard, it may be seen in a more ornate form, and nearly resembling the papal crosier as borne at this day. * This was the case in Egypt, after the Babylonian power was established there, as the statues of Osiris with his crosier bear witness, ** Osiris himself being frequently represented as a crosier with an eye above it. 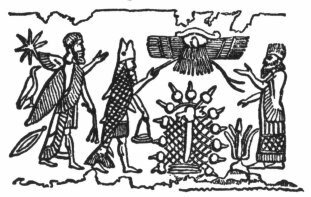 * Nineveh and Babylon. Layard seems to think the instrument referred to, which is borne by the king, “attired as high priest in his sacrificial robes,” a sickle; but any one who attentively examines it will see that it is a crosier, adorned with studs, as is commonly the case even now with the Roman crosiers, only, that instead of being held erect, it is held downwards. ** The well known name Pharaoh, the title of the Pontiff-kings of Egypt, is just the Egyptian form of the Hebrew He-Roe. Pharaoh in Genesis, without the points, is “Phe-Roe.” Phe is the Egyptian definite article. It was not shepherd-kings that the Egyptians abhorred, but Roi-Tzan, “shepherds of cattle” (Gen 46:34). Without the article Roe, a “shepherd,” is manifestly the original of the French Roi, a king, whence the adjective royal; and from Ro, which signifies to “act the shepherd,” which is frequently pronounced Reg —(with Sh, which signifies “He who is,” or “who does,” affixed)— comes Regah, “He who acts the shepherd,” whence the Latin Rex, and Regal. This is the case among the Negroes of Africa, whose god, called the Fetiche, is represented in the form of a crosier, as is evident from the following words of Hurd: “They place Fetiches before their doors, and these titular deities are made in the form of grapples or hooks, which we generally make use of to shake our fruit trees.” This is the case at this hour in Thibet, where the Lamas or Theros bear, as stated by the Jesuit Huc, a crosier, as the ensign of their office. This is the case even in the far-distant Japan, where, in a description of the idols of the great temple of Miaco, the spiritual capital, we find this statement: “Their heads are adorned with rays of glory, and some of them have shepherds’ crooks in their hands, pointing out that they are the guardians of mankind against all the machinations of evil spirits.” The crosier of the Pope, then, which he bears as an emblem of his office, as the great shepherd of the sheep, is neither more nor less than the augur’s crooked staff, or magic rod of the priests of Nimrod.